This dish is best with pasta corta (short pasta) because the broccoli will not stick to the pasta. If all you have at hand is spaghetti, linguine or fettuccine, just break them up into small pieces before cooking. The quantities show are per serving for a "one dish meal." If you are planning on a multi-course meal, cut them in half. 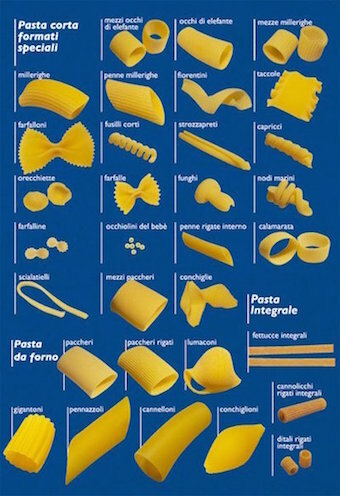 I weigh the pasta but everything else is by eye so feel free to change the quantities to match your taste. The olives give the dish a rather distinctive taste. You might want to start with fewer olives and the next time you make it use more or fewer to suit your taste. I usually parboil the broccoli and keep it in the freezer. I have to take it out of the freezer ahead of time to let it thaw, maybe half an hour. If you are using fresh broccoli, parboil it for couple of minutes in salt water. Put it on ice to stop the cooking. Set aside. Fine mince together the garlic, the sweet peppers and the olives. Set aside. Dice the broccoli florets. Set aside. Set the pasta to boil in salt water. At the same time heat olive oil in a pan at medium heat. Add the minced garlic, sweet peppers and olives. After a minute or two add the broccoli florets and a pinch of salt. Stir. Depending on the pasta you are using the cooking time will vary. For best results try to time it so the pasta and the broccoli are ready at the same time. Drain the pasta and stir it together with the broccoli. Serve piping hot.